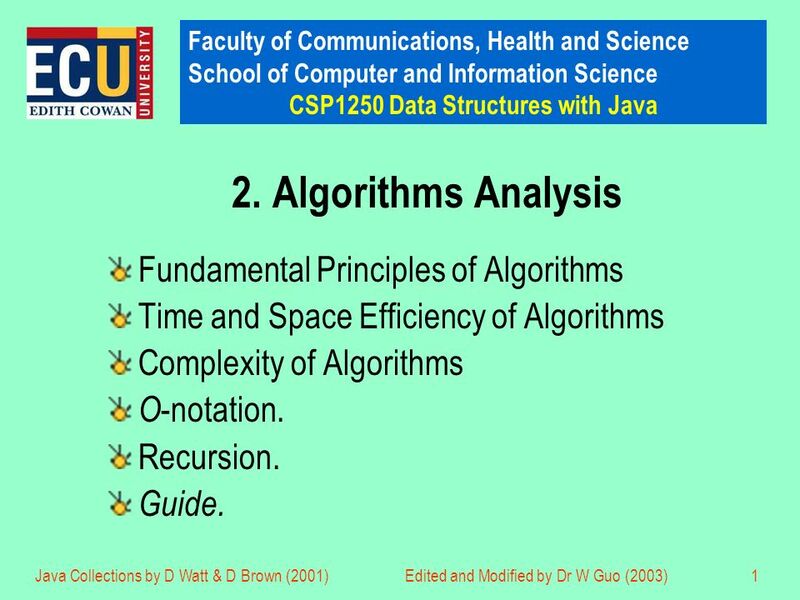 1 Faculty of Communications, Health and Science School of Computer and Information Science CSP1250 Data Structures with Java Java Collections by D Watt & D Brown (2001)Edited and Modified by Dr W Guo (2003)1 2. 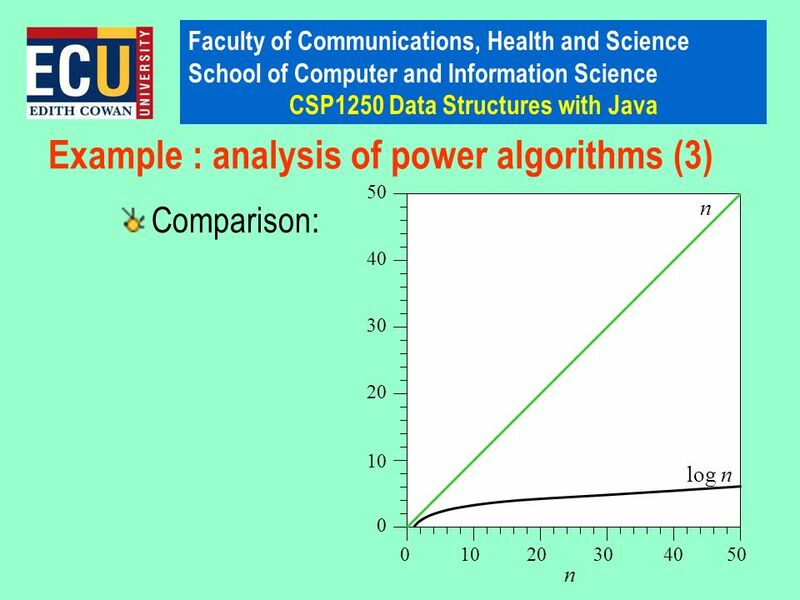 Algorithms Analysis Fundamental Principles of Algorithms Time and Space Efficiency of Algorithms Complexity of Algorithms O -notation. Recursion. Guide. 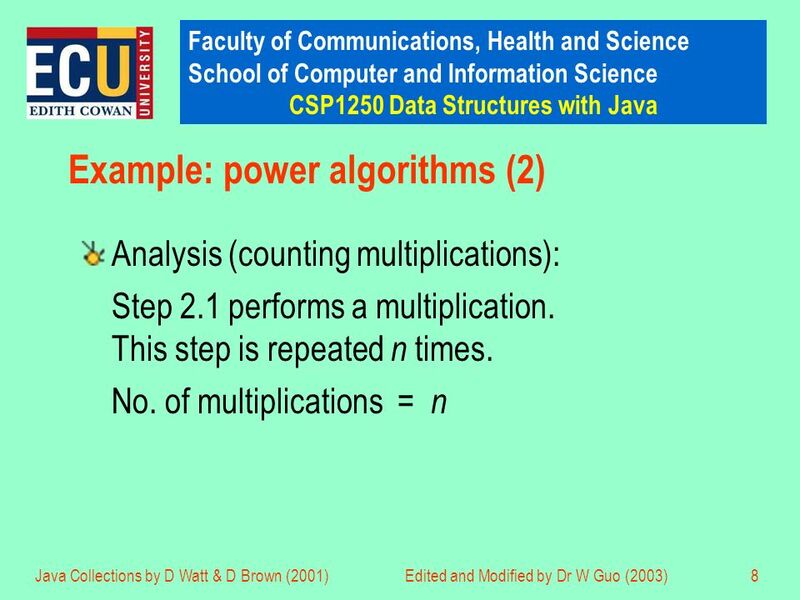 2 Faculty of Communications, Health and Science School of Computer and Information Science CSP1250 Data Structures with Java Java Collections by D Watt & D Brown (2001)Edited and Modified by Dr W Guo (2003)2 Principles (1) An algorithm is a step-by-step procedure for solving a stated problem. 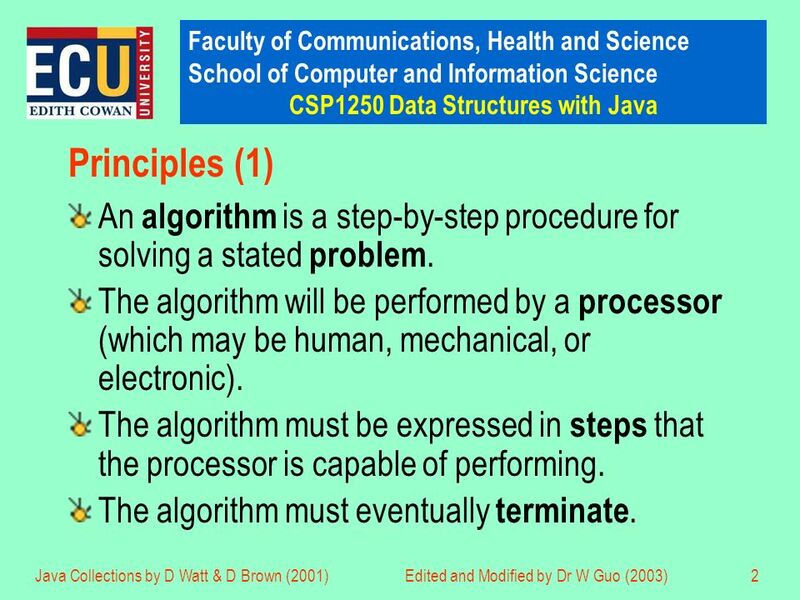 The algorithm will be performed by a processor (which may be human, mechanical, or electronic). 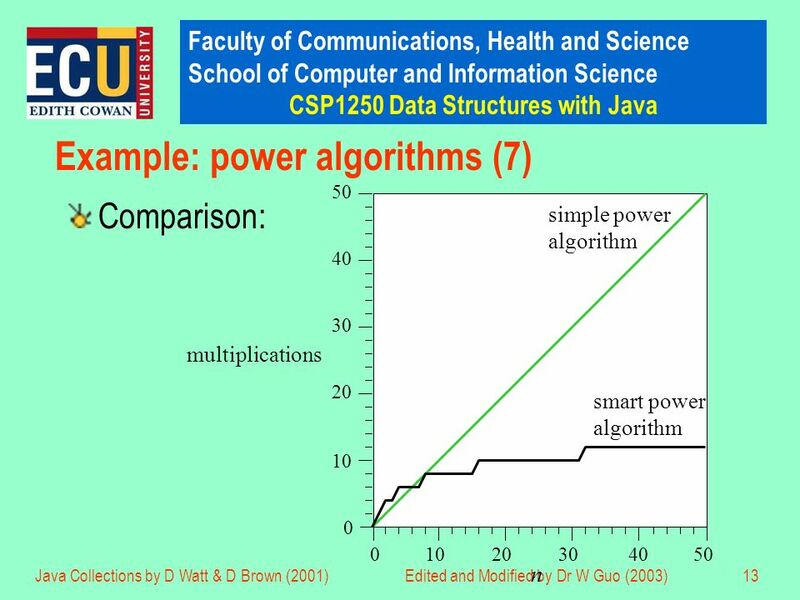 The algorithm must be expressed in steps that the processor is capable of performing. The algorithm must eventually terminate. 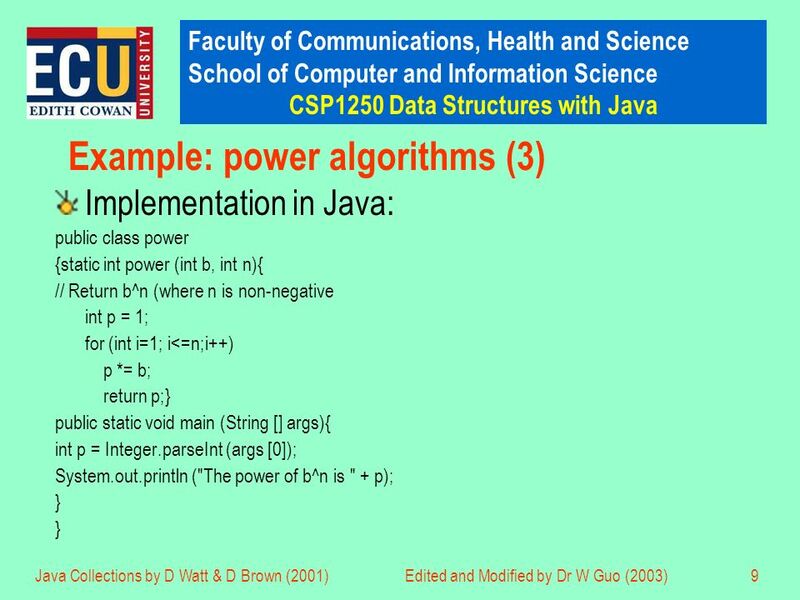 3 Faculty of Communications, Health and Science School of Computer and Information Science CSP1250 Data Structures with Java Java Collections by D Watt & D Brown (2001)Edited and Modified by Dr W Guo (2003)3 Principles (2) The algorithm must be expressed in some language that the processor understands. (But the underlying procedure is independent of the particular language chosen.) The stated problem must be solvable, i.e., capable of solution by a step-by-step procedure. 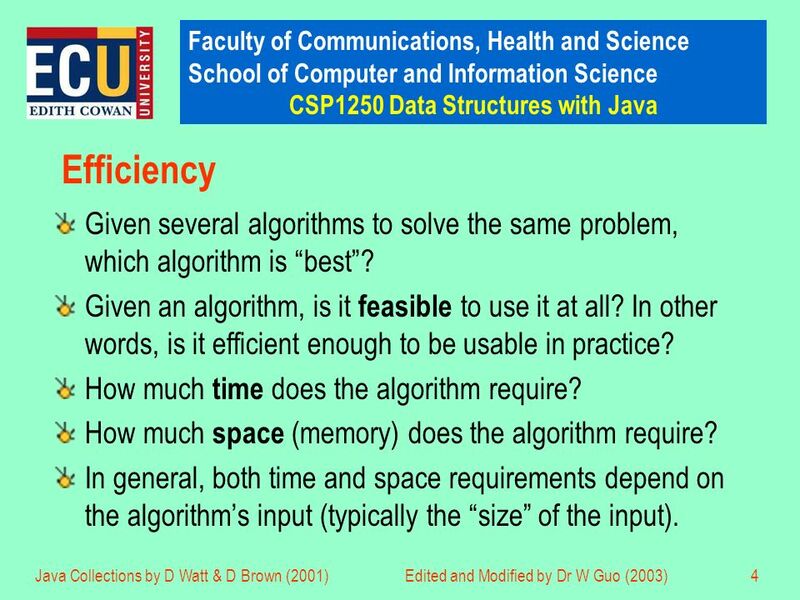 4 Faculty of Communications, Health and Science School of Computer and Information Science CSP1250 Data Structures with Java Java Collections by D Watt & D Brown (2001)Edited and Modified by Dr W Guo (2003)4 Efficiency Given several algorithms to solve the same problem, which algorithm is best? 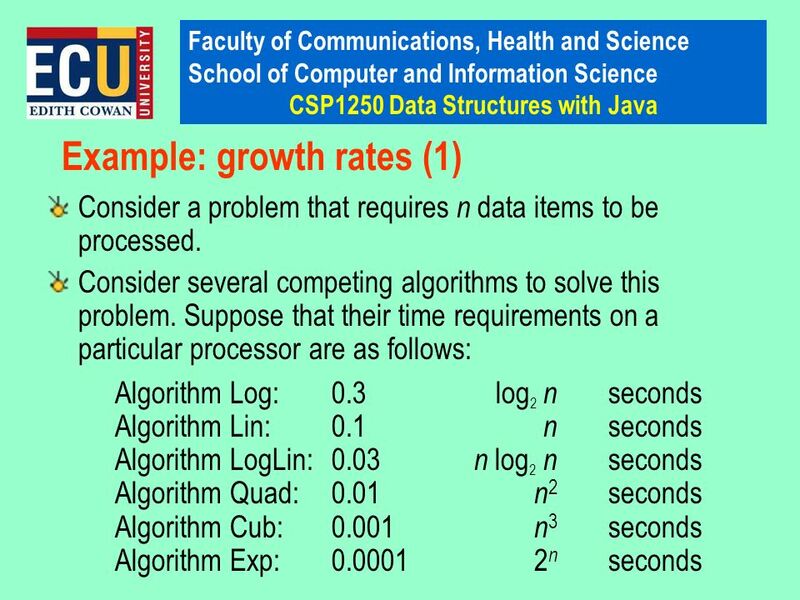 Given an algorithm, is it feasible to use it at all? In other words, is it efficient enough to be usable in practice? How much time does the algorithm require? How much space (memory) does the algorithm require? 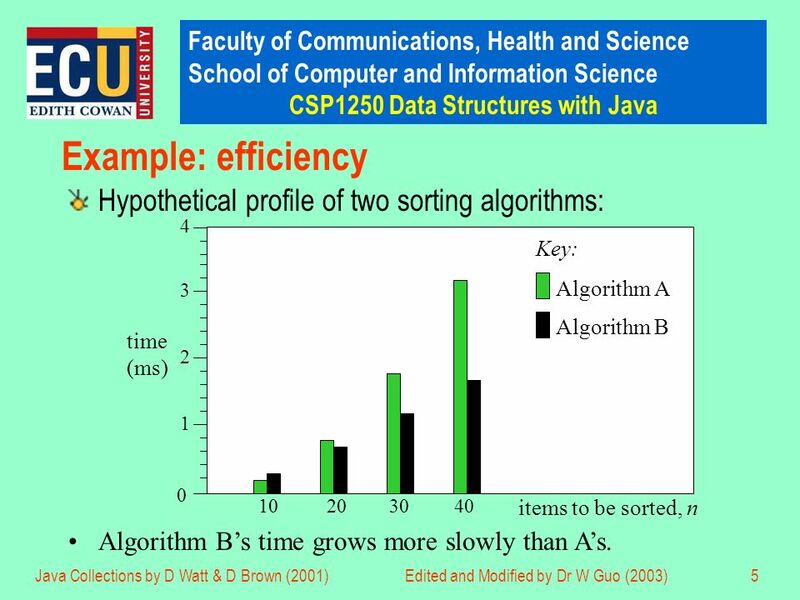 In general, both time and space requirements depend on the algorithms input (typically the size of the input). 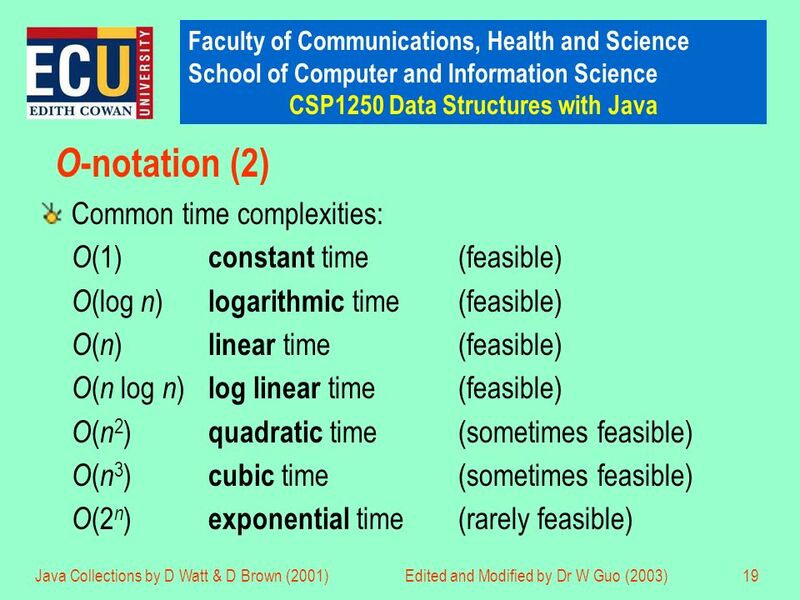 6 Faculty of Communications, Health and Science School of Computer and Information Science CSP1250 Data Structures with Java Java Collections by D Watt & D Brown (2001)Edited and Modified by Dr W Guo (2003)6 Efficiency: measuring time Measure time in seconds? 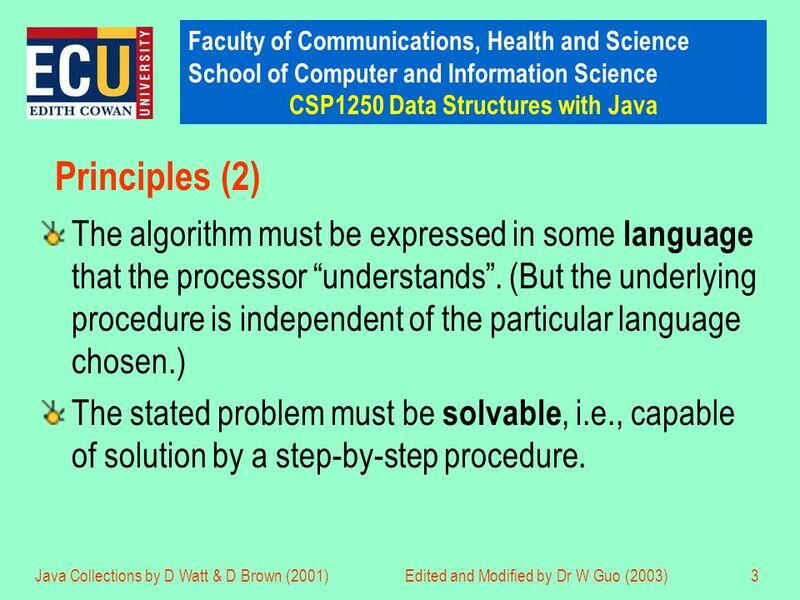 + is useful in practice – depends on language, compiler, and processor. 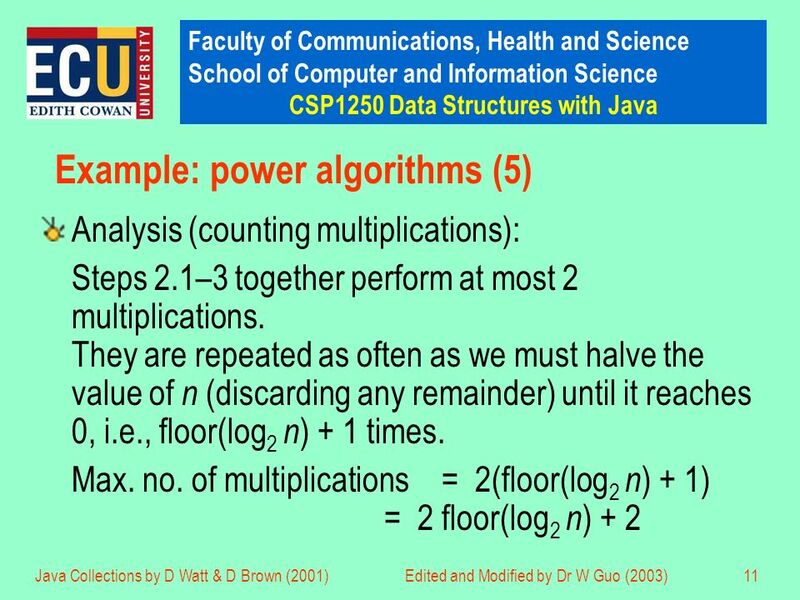 Count algorithm steps? + does not depend on compiler or processor – depends on granularity of steps. Count characteristic operations ? 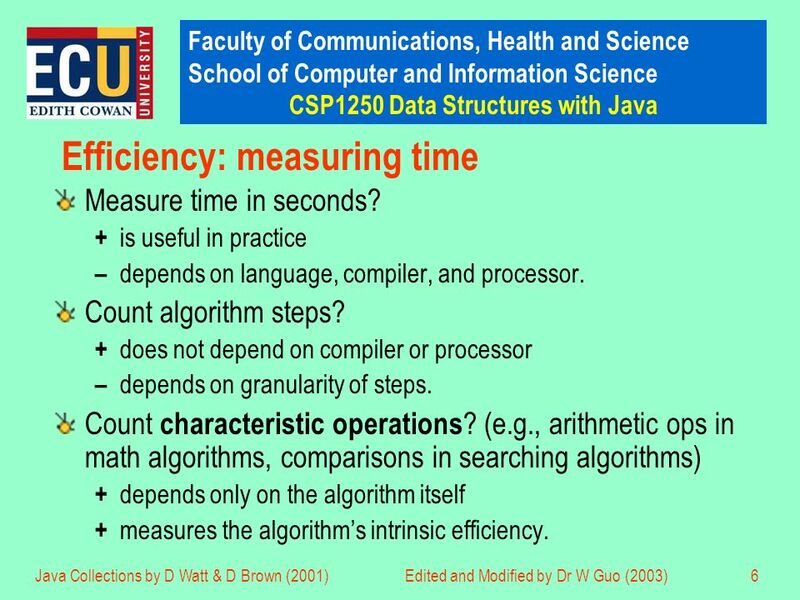 (e.g., arithmetic ops in math algorithms, comparisons in searching algorithms) + depends only on the algorithm itself + measures the algorithms intrinsic efficiency. 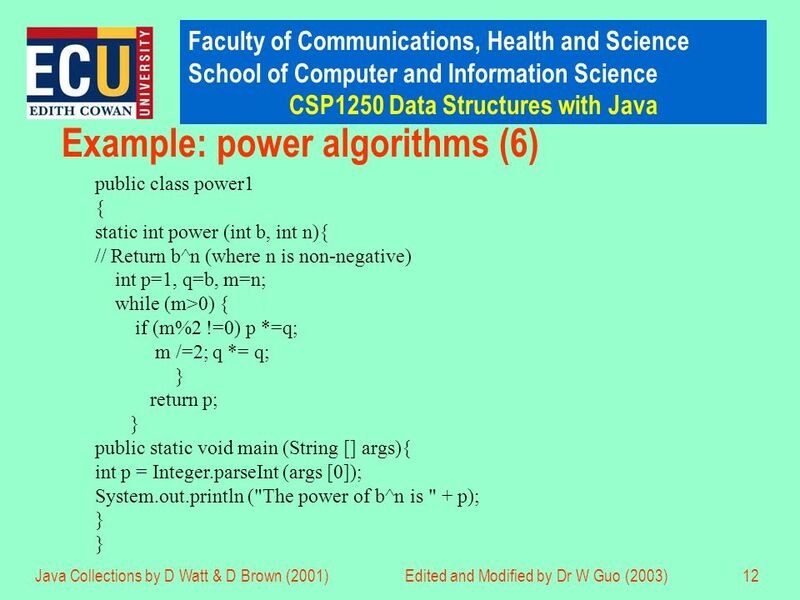 7 Faculty of Communications, Health and Science School of Computer and Information Science CSP1250 Data Structures with Java Java Collections by D Watt & D Brown (2001)Edited and Modified by Dr W Guo (2003)7 Example: power algorithms (1) Simple power algorithm : To compute b n : 1.Set p to 1. 2.For i = 1, …, n, repeat: 2.1.Multiply p by b. 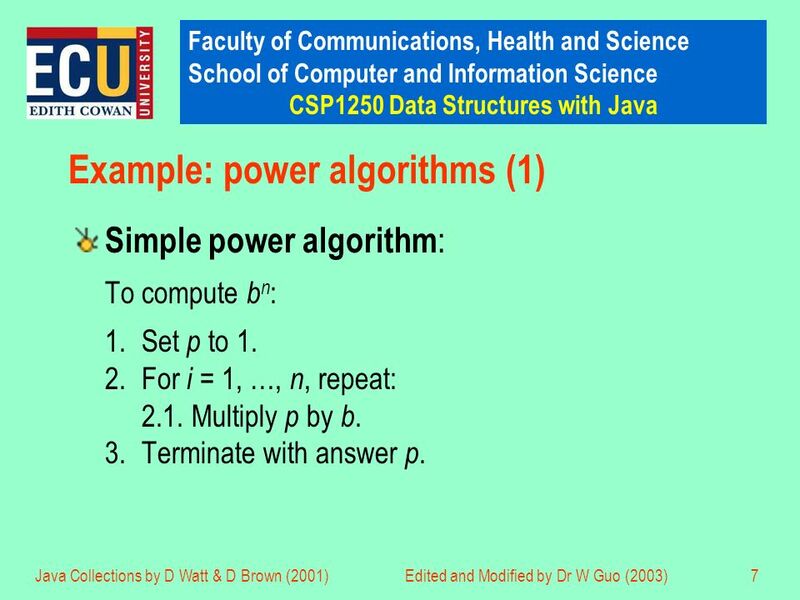 3.Terminate with answer p.
10 Faculty of Communications, Health and Science School of Computer and Information Science CSP1250 Data Structures with Java Java Collections by D Watt & D Brown (2001)Edited and Modified by Dr W Guo (2003)10 Example: power algorithms (4) Idea: b 1000 = b 500 b 500. If we know b 500, we can compute b 1000 with only 1 more multiplication! 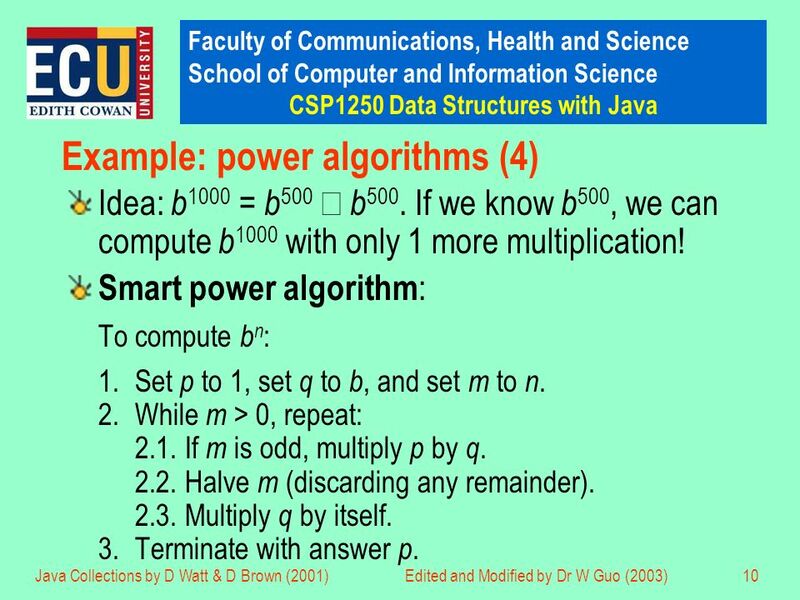 Smart power algorithm : To compute b n : 1.Set p to 1, set q to b, and set m to n. 2.While m > 0, repeat: 2.1.If m is odd, multiply p by q. 2.2.Halve m (discarding any remainder). 2.3.Multiply q by itself. 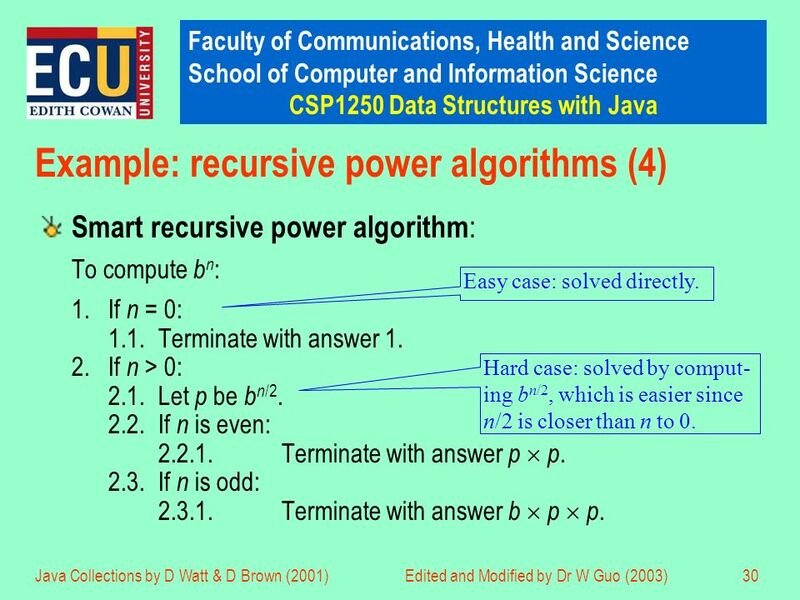 3.Terminate with answer p.
14 Faculty of Communications, Health and Science School of Computer and Information Science CSP1250 Data Structures with Java Java Collections by D Watt & D Brown (2001)Edited and Modified by Dr W Guo (2003)14 Complexity For many interesting algorithms, the exact number of operations is too difficult to analyse mathematically. To simplify the analysis: –identify the fastest-growing term –neglect slower-growing terms –neglect the constant factor in the fastest-growing term. 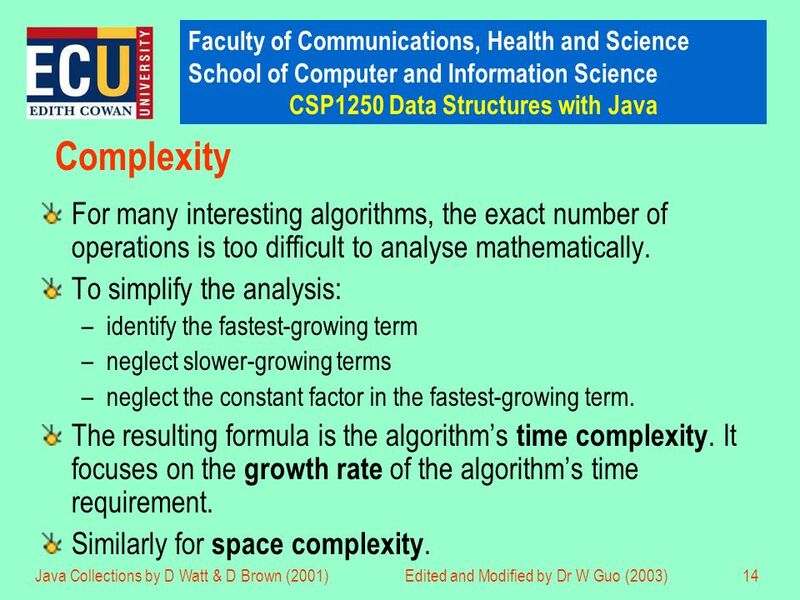 The resulting formula is the algorithms time complexity. 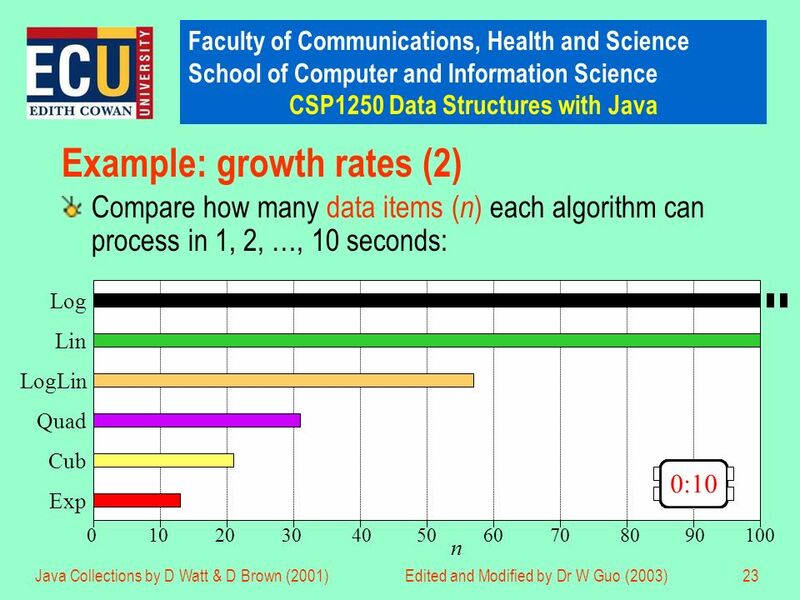 It focuses on the growth rate of the algorithms time requirement. Similarly for space complexity. 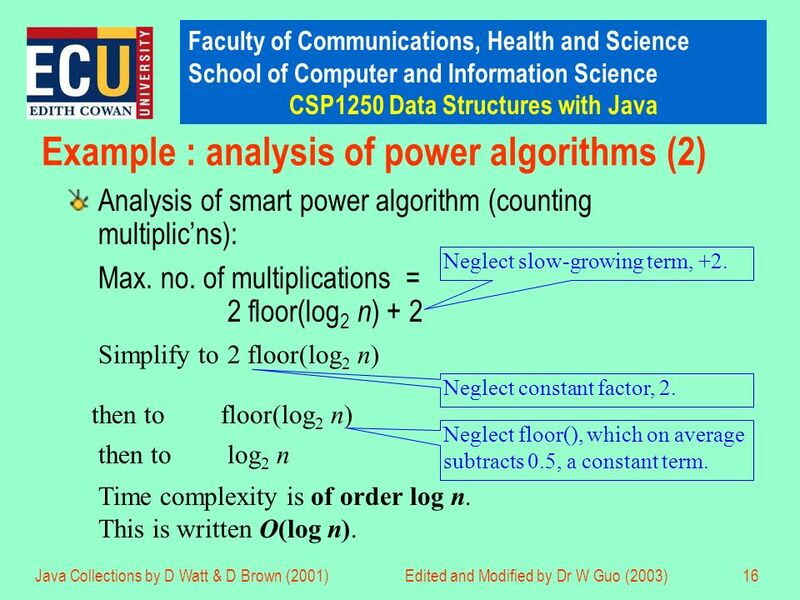 15 Faculty of Communications, Health and Science School of Computer and Information Science CSP1250 Data Structures with Java Java Collections by D Watt & D Brown (2001)Edited and Modified by Dr W Guo (2003)15 Example : analysis of power algorithms (1) Analysis of simple power algorithm (counting multiplications): No. 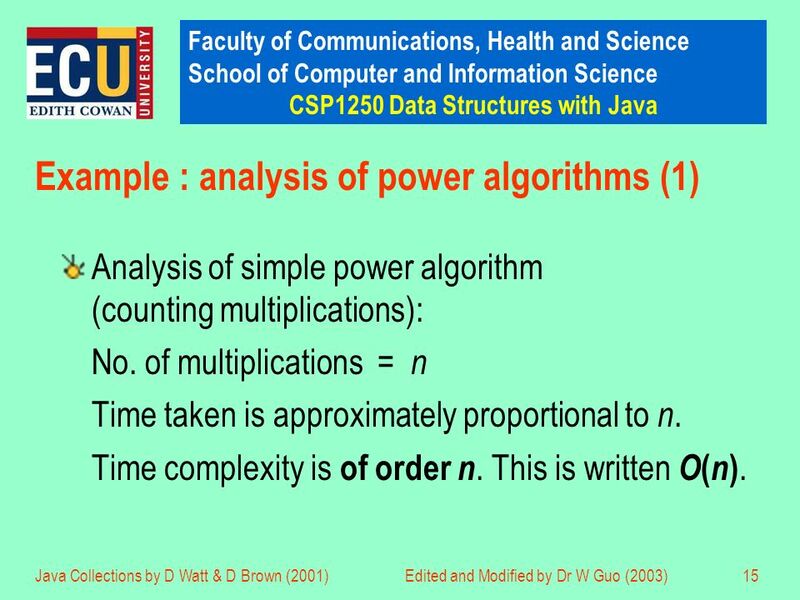 of multiplications = n Time taken is approximately proportional to n. Time complexity is of order n. This is written O ( n ). 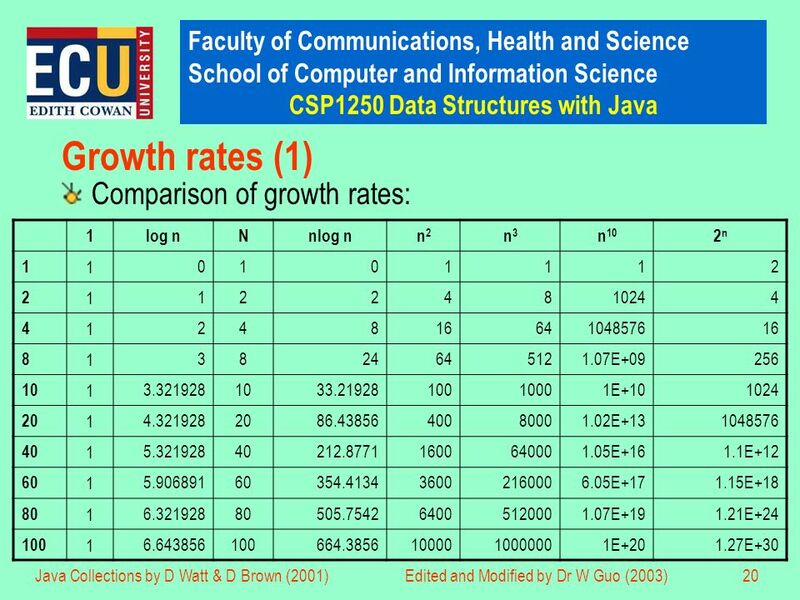 18 Faculty of Communications, Health and Science School of Computer and Information Science CSP1250 Data Structures with Java Java Collections by D Watt & D Brown (2001)Edited and Modified by Dr W Guo (2003)18 O -notation (1) We have seen that an O (log n ) algorithm is inherently better than an O ( n ) algorithm for large values of n. O (log n ) signifies a slower growth rate than O ( n ). 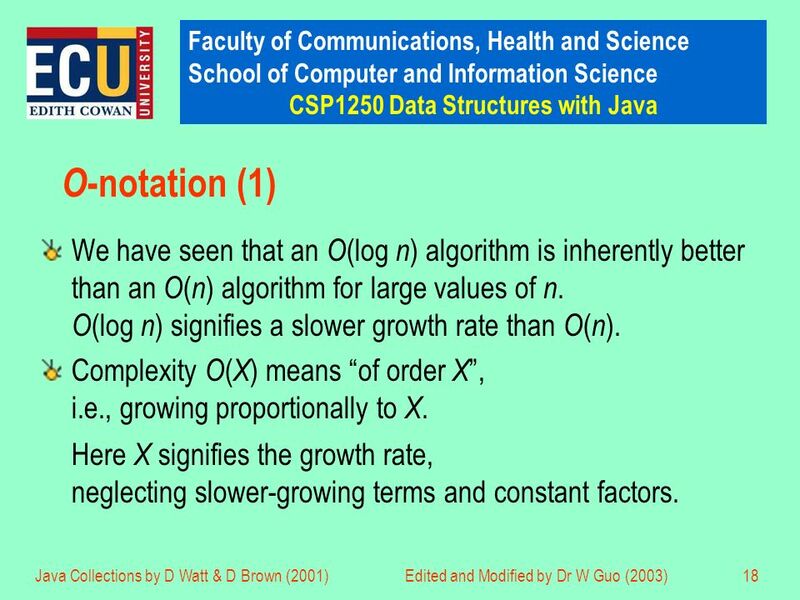 Complexity O ( X ) means of order X, i.e., growing proportionally to X. Here X signifies the growth rate, neglecting slower-growing terms and constant factors. 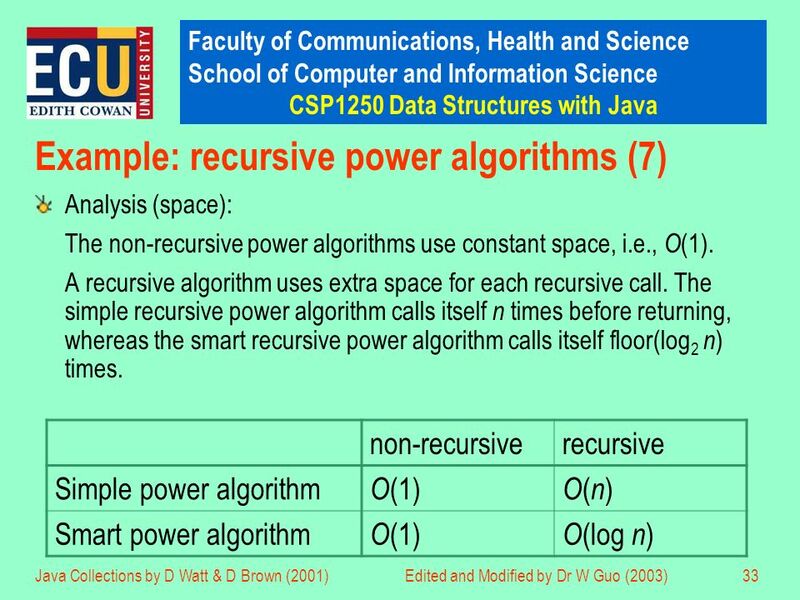 24 Faculty of Communications, Health and Science School of Computer and Information Science CSP1250 Data Structures with Java Java Collections by D Watt & D Brown (2001)Edited and Modified by Dr W Guo (2003)24 Recursion A recursive algorithm is one expressed in terms of itself. 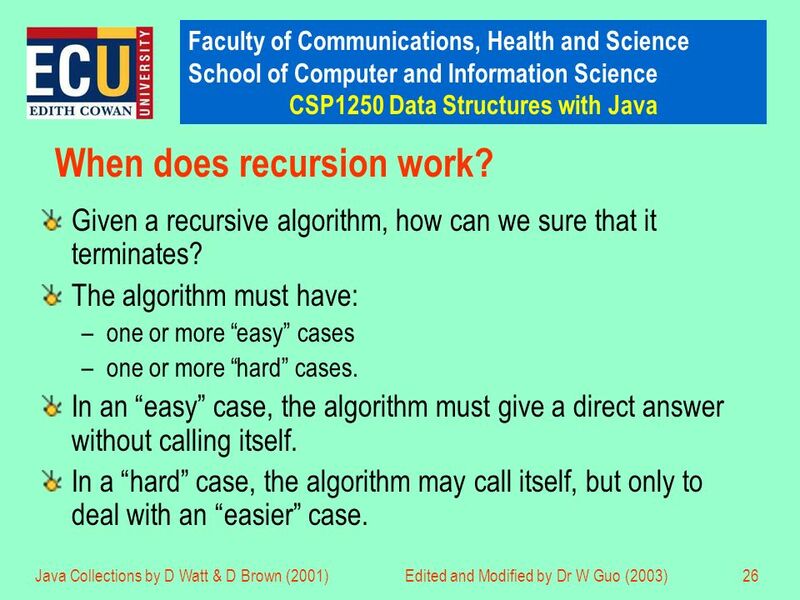 In other words, at least one step of a recursive algorithm is a call to itself. 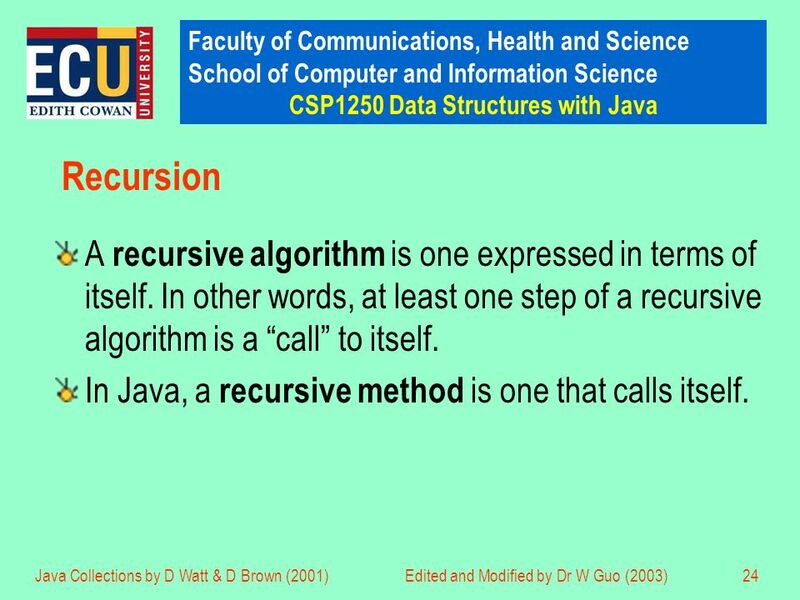 In Java, a recursive method is one that calls itself. 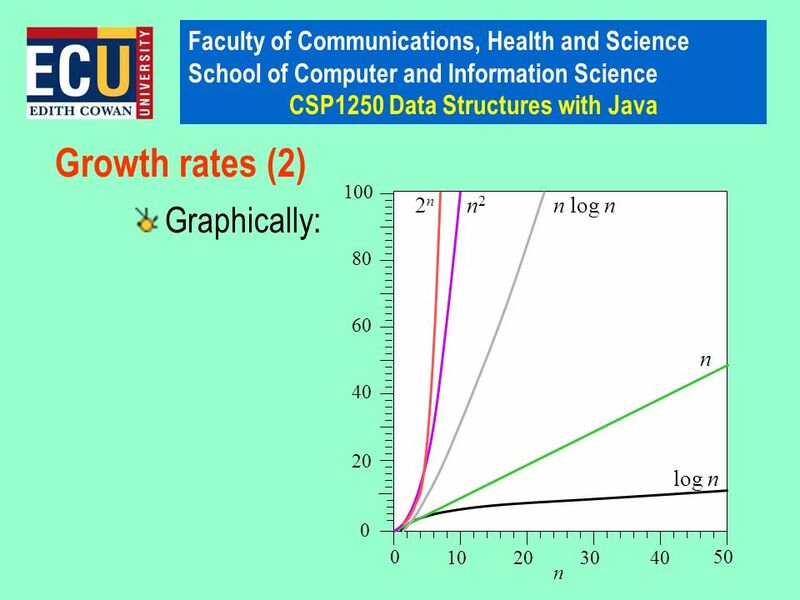 25 Faculty of Communications, Health and Science School of Computer and Information Science CSP1250 Data Structures with Java Java Collections by D Watt & D Brown (2001)Edited and Modified by Dr W Guo (2003)25 When should recursion be used? Sometimes an algorithm can be expressed using either iteration or recursion. 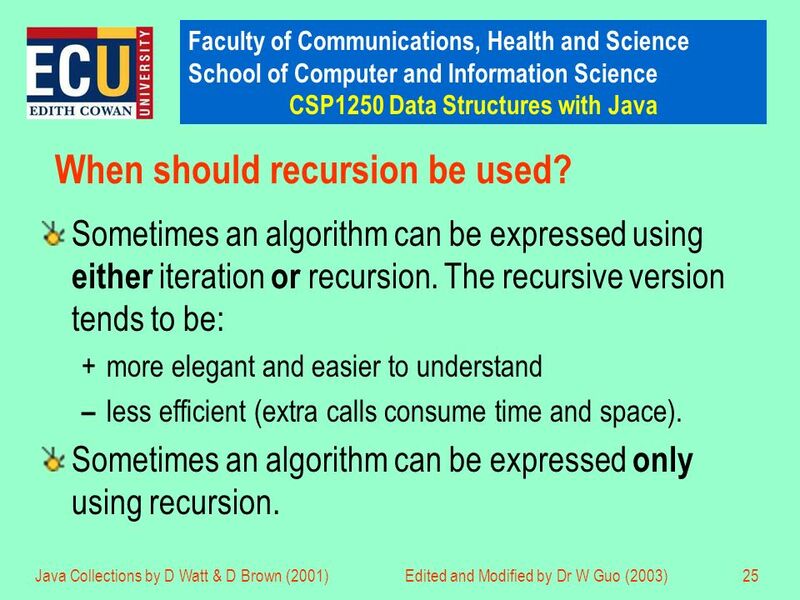 The recursive version tends to be: +more elegant and easier to understand – less efficient (extra calls consume time and space). Sometimes an algorithm can be expressed only using recursion. 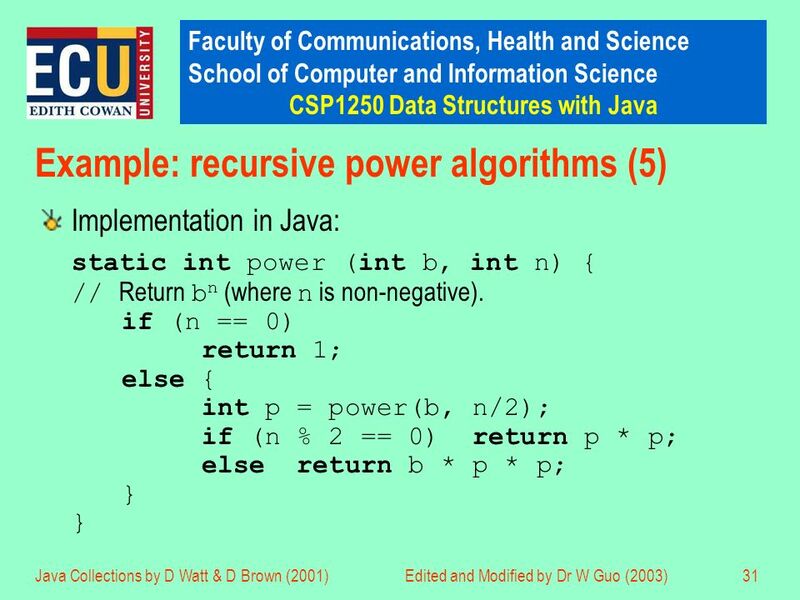 26 Faculty of Communications, Health and Science School of Computer and Information Science CSP1250 Data Structures with Java Java Collections by D Watt & D Brown (2001)Edited and Modified by Dr W Guo (2003)26 When does recursion work? 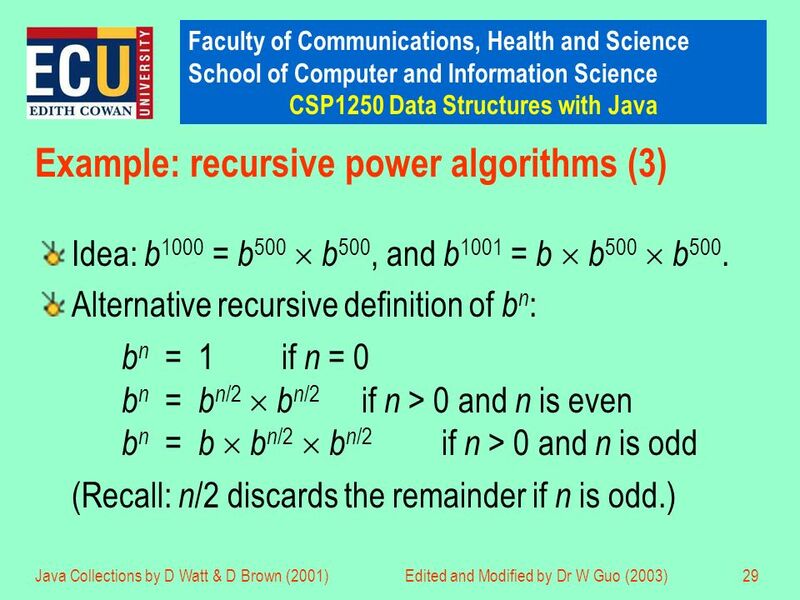 Given a recursive algorithm, how can we sure that it terminates? The algorithm must have: –one or more easy cases –one or more hard cases. In an easy case, the algorithm must give a direct answer without calling itself. In a hard case, the algorithm may call itself, but only to deal with an easier case. 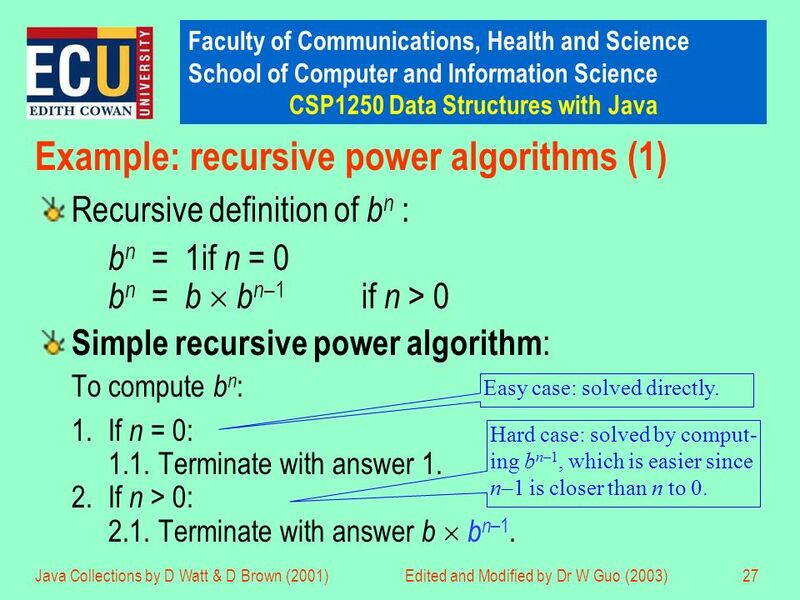 27 Faculty of Communications, Health and Science School of Computer and Information Science CSP1250 Data Structures with Java Java Collections by D Watt & D Brown (2001)Edited and Modified by Dr W Guo (2003)27 Example: recursive power algorithms (1) Recursive definition of b n : b n = 1if n = 0 b n = b b n –1 if n > 0 Simple recursive power algorithm : To compute b n : 1.If n = 0: 1.1.Terminate with answer 1. 2.If n > 0: 2.1.Terminate with answer b b n –1. Easy case: solved directly. Hard case: solved by comput- ing b n–1, which is easier since n–1 is closer than n to 0. 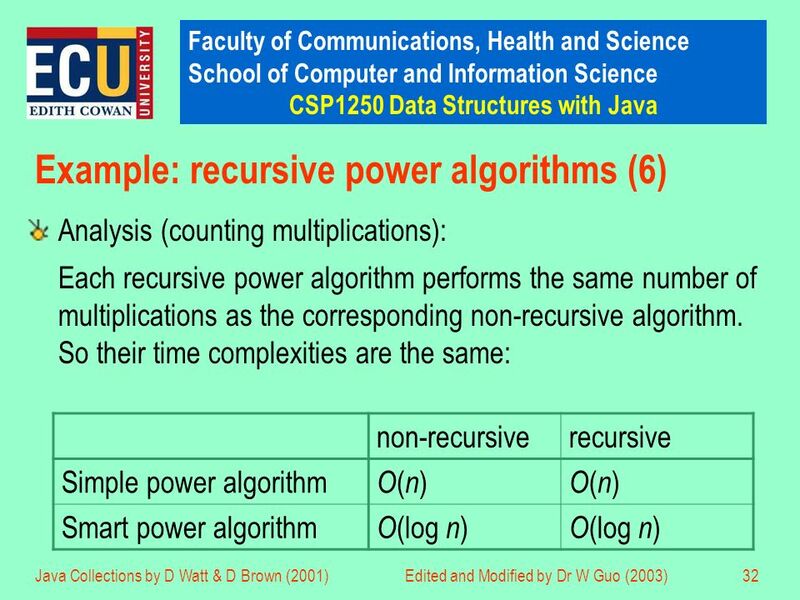 30 Faculty of Communications, Health and Science School of Computer and Information Science CSP1250 Data Structures with Java Java Collections by D Watt & D Brown (2001)Edited and Modified by Dr W Guo (2003)30 Example: recursive power algorithms (4) Smart recursive power algorithm : To compute b n : 1.If n = 0: 1.1.Terminate with answer 1. 2.If n > 0: 2.1.Let p be b n /2. 2.2.If n is even: 2.2.1.Terminate with answer p p. 2.3.If n is odd: 2.3.1.Terminate with answer b p p. Easy case: solved directly. Hard case: solved by comput- ing b n/2, which is easier since n/2 is closer than n to 0. 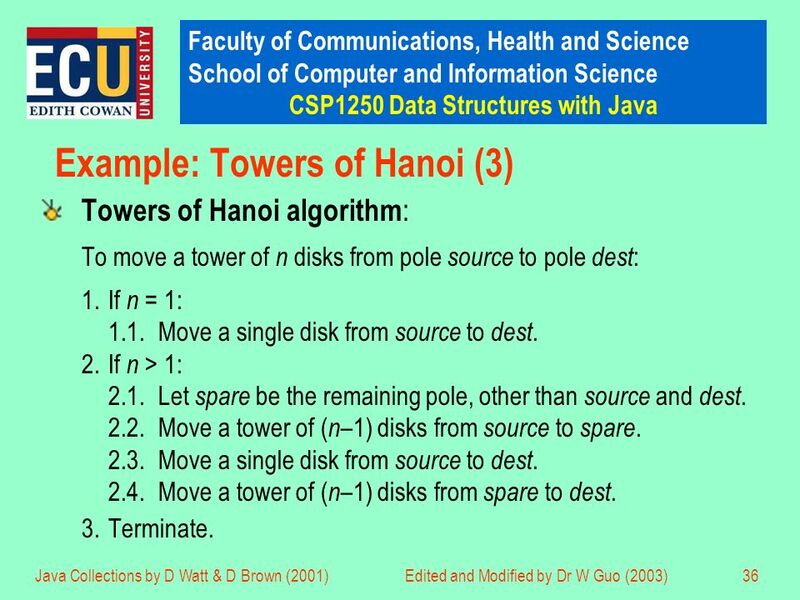 34 Faculty of Communications, Health and Science School of Computer and Information Science CSP1250 Data Structures with Java Java Collections by D Watt & D Brown (2001)Edited and Modified by Dr W Guo (2003)34 Example: Towers of Hanoi (1) Three vertical poles (1, 2, 3) are mounted on a platform. A number of differently-sized disks are threaded on to pole 1, forming a tower with the largest disk at the bottom and the smallest disk at the top. We may move one disk at a time, from any pole to any other pole, but we must never place a larger disk on top of a smaller disk. Problem: Move the tower of disks from pole 1 to pole 2. 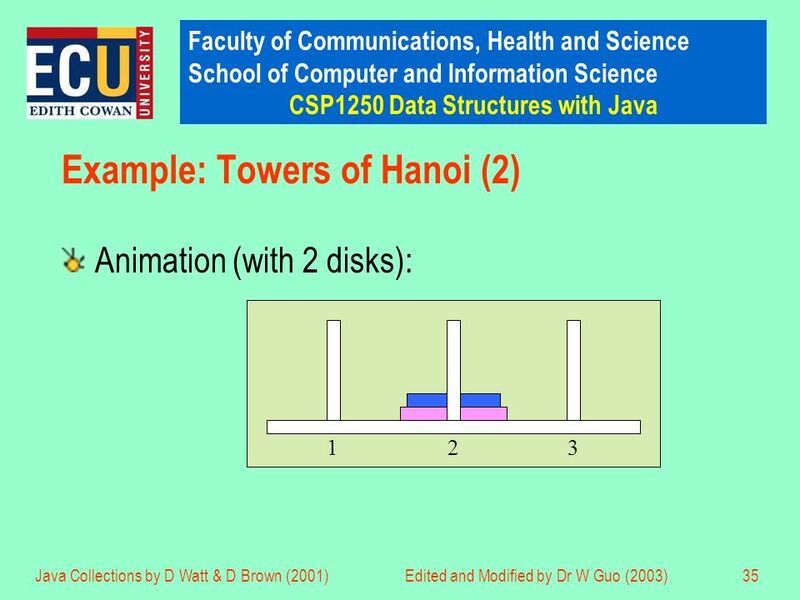 36 Faculty of Communications, Health and Science School of Computer and Information Science CSP1250 Data Structures with Java Java Collections by D Watt & D Brown (2001)Edited and Modified by Dr W Guo (2003)36 Example: Towers of Hanoi (3) Towers of Hanoi algorithm : To move a tower of n disks from pole source to pole dest : 1.If n = 1: 1.1.Move a single disk from source to dest. 2.If n > 1: 2.1.Let spare be the remaining pole, other than source and dest. 2.2.Move a tower of ( n –1) disks from source to spare. 2.3.Move a single disk from source to dest. 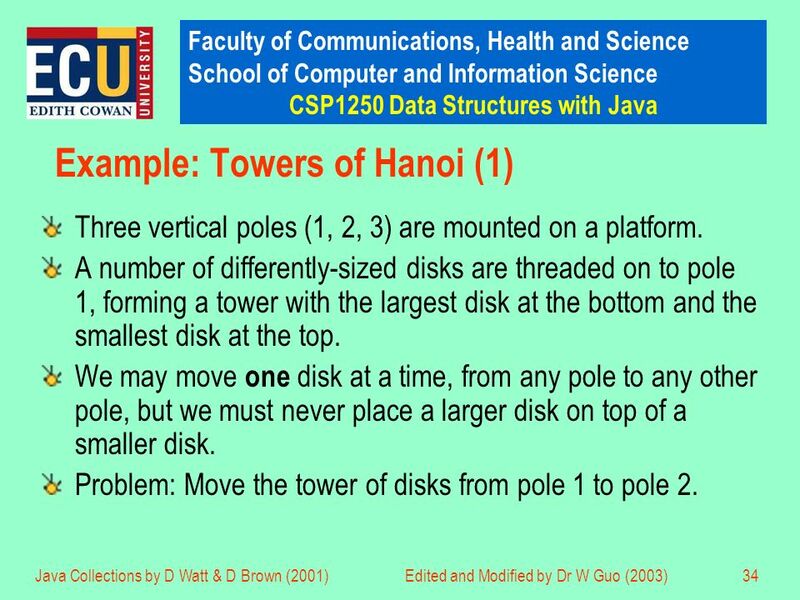 2.4.Move a tower of ( n –1) disks from spare to dest. 3.Terminate. 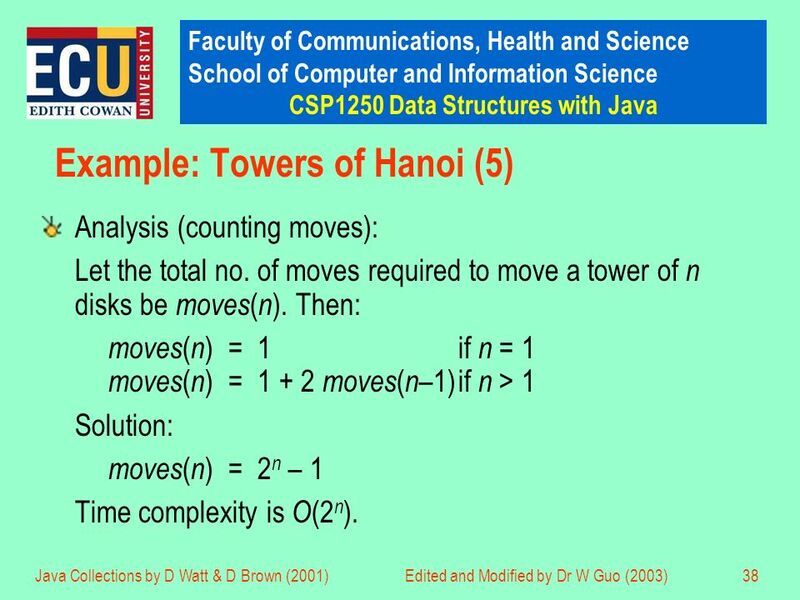 38 Faculty of Communications, Health and Science School of Computer and Information Science CSP1250 Data Structures with Java Java Collections by D Watt & D Brown (2001)Edited and Modified by Dr W Guo (2003)38 Example: Towers of Hanoi (5) Analysis (counting moves): Let the total no. 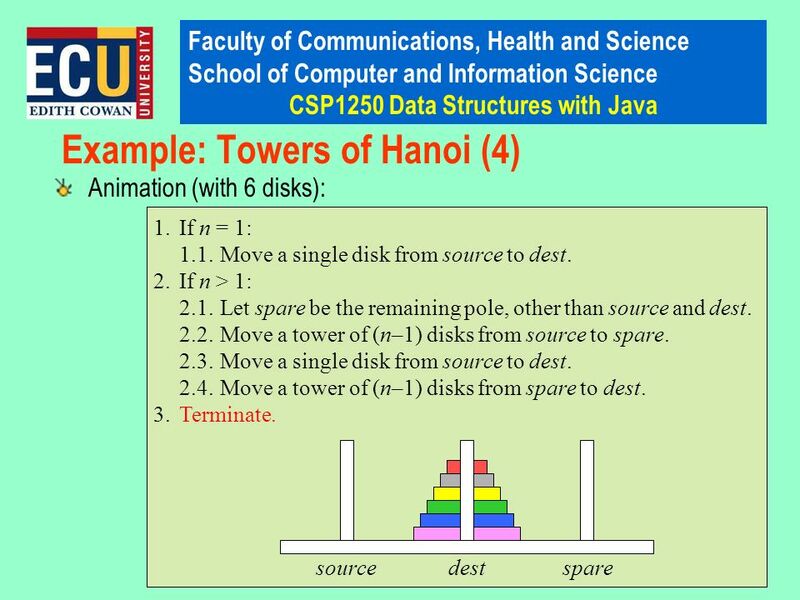 of moves required to move a tower of n disks be moves ( n ). Then: moves ( n ) = 1if n = 1 moves ( n ) = 1 + 2 moves ( n –1)if n > 1 Solution: moves ( n ) = 2 n – 1 Time complexity is O (2 n ). 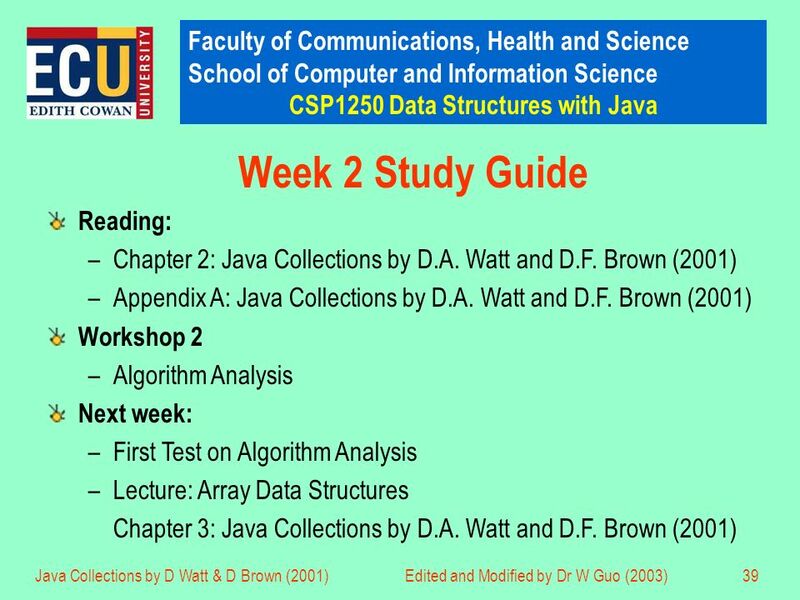 Download ppt "Faculty of Communications, Health and Science School of Computer and Information Science CSP1250 Data Structures with Java Java Collections by D Watt &"
2. Getting Started Heejin Park College of Information and Communications Hanyang University. 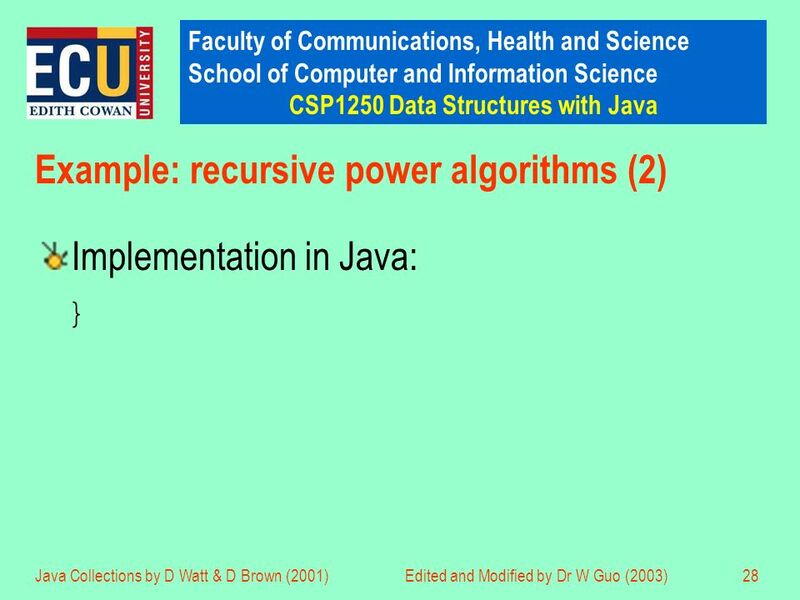 © 2006 Pearson Education Chapter 8: Recursion Presentation slides for Java Software Solutions for AP* Computer Science A 2nd Edition by John Lewis, William. MAT 205 F08 Chapter 12 Complex Numbers.